Cardiovascular Disease is prevalent in the United States. Dr. Amy Epps, Cardiologist, indicates Congestive Heart Failure and Bypasses are commonplace. Millions of Americas have one or more forms of cardiovascular disease. Although many people don’t realize it, heart disease is the most common killer today. Cardiovascular disease outweighs the next five or six common causes of death. Cardiovascular disease can include the vascular diseases as well as heart disease. Can show up as a squeezing or heaviness in the chest, or a feeling of pressure in the chest. can be unexplained pain in the lower jaw. Often, symptoms go undetectable, and people may think they are not impacted, but absence of crushing chest pain does not mean you are not having some sort of heart disease. Diabetes in particular is especially serious – it is such a strong risk factor for heart disease. It is estimated that 2400 Americans are killed each day from heart disease… that is one death somewhere in the United States every 36 seconds. The 2007 estimated indirect cost for heart disease was $431 Billion dollars. In 2010, coronary heart disease alone was projected to cost the United States $108.9 billion.3 This total includes the cost of health care services, medications, and lost productivity. April 26, 2010, Katrina Woznicki of WebMd Health News reports — Nearly half of the U.S. population has at least one of three diagnosed or undiagnosed chronic conditions — high blood pressure, high cholesterol, or diabetes — all major risk factors for heart disease, the leading cause of death among Americans, according to a new CDC study. Data collected from the ongoing National Health and Nutrition Examination Survey shows that 45% of Americans had one of these three conditions either diagnosed or undiagnosed; 13% of adults had two of these conditions, and 3% had all three conditions. CDC researchers also found that 15% of adults also had one or more of these conditions undiagnosed. It is well known that high blood pressure, high cholesterol, and diabetes all increase the risk for cardiovascular disease, a condition that affects more than 81 million Americans and accounts for one out of every three deaths in the U.S. What is less known is the co-existence of these three conditions based on race/ethnicity, as well as the prevalence of diagnosed vs. undiagnosed high blood pressure, high cholesterol, and diabetes among these groups. The study shows that about 8% of adults have undiagnosed high blood pressure, 8% have undiagnosed high cholesterol, and 3% of have undiagnosed diabetes. The proportion of adults with these undiagnosed conditions was similar across racial/ethnic groups. Additional information about Cardiovascular Disease can be found my blog. Gary Denson has had high blood pressure since he was 22. By age 30 he was send home from work because his blood pressure was out of control. By the time he was 37 he had a heart attack and his blood pressure was 280/260. Are you looking for a Chevy Volt customer review? If so, check out this video and see what it is like to ride in the Chevy Volt. In this Chevy Volt customer review we take you on a nice little drive around the neighborhood including some highway driving and stop n go areas in the residential section. Take a ride in the Chevy Volt and see why it becoming such a popular car. This Chevy Volt Customer Review includes seeing many of the features including power management, climate control, how quiet and smooth the Volt drives. One thing you will notice in this Chevy Volt customer review video is that there is no transmission or gear shifting when the Volt is accelerating or decelerating. The electric motor’s forte is at the slow speeds where it offers powerful torque and no shifting of gears. In one of my other Chevy Volt Customer Review videos, I show how the Volt plugs in for charging the battery, and in yet another I show the math to demonstrate its mileage performance achieving greater than 630 miles per gallon. Good stuff! Note about the recording: Please note that in this Chevy Volt customer review video we used a video camera with an aggressive microphone – it actively tries to balance the sound level, so in the video when I am not speaking the camera is picking up a level of noise that we do not normally hear or notice with our natural ears. The Chevy Volt is capturing the hearts of many people across the country and world. I personally followed the Volt for nearly two years before we made the decision to purchase one. An important factor in our decision was reading what many existing Chevy Volt owners reported in their Chevy Volt Customer Review stories. It was very helpful to find out what kind of mileage they were getting, what the pros and cons were for the car, and what variables affect the mileage. So, I appreciate what other folks shared about their experiences. Hopefully my reviews will help someone else seeking for information. Another thing that helped us make the decision to purchase the Chevy Volt was the fact that our prior car was costing more than a car payment. So a choice we were faced with was whether we should get a new car payment and also keep the “gas payment”, or whether we should get the Volt and just have the car payment. Obviously, we opted for just the car payment. I had basically decided that I did not wish to continue spending $60 to $70 every time I went to the gas station, which was happening nearly every week in our prior vehicle. With the Chevy Volt, in over two months, we have only burned 3.2 gallons of gasoline. I have only put 3.9 gallons of gas in the car since we have owned it, and I would not have needed to do that because we have not used a full tank worth of gas – we have used less than 8 gallons of gas in nearly 3,000 miles. Our most recent 2,050 miles we have achieved about 650 miles per gallon. So we have essentially eliminated a gas payment for one of our vehicles. And my expectations for the Chevy Volt providing electric only transportation for my daily commute has been nicely exceeded. I LOVE my Chevy Volt! As we continue to gain experience with the Volt, I will provide additional Chevy Volt customer review reports. So I can cover topics that will be most helpful to you, please provide your comments in the form below to let me know what other information you would like to see in a future Chevy Volt Customer Review. Also, please let me know what you liked, if anything, in this Chevy Volt Customer Review, and what you were searching for when you found us. Are you planning on getting a Volt? Just curious? Comparing with hybrids? Want to help the ecology? I’m anxious to hear your comments and questions. Also, if you own a Volt and have provided a Chevy Volt customer review, please provide the link so I can see your experience with the volt. See how the Voltec 240-volt charging station connects to the Chevy Volt, and how it is installed in the garage. Our Chevy Volt is getting 630 miles per gallon in the most recent 2040 miles! This video shows how easy it is to unplug the Chevy Volt from the 240-volt Voltec charging station. The Voltec charging station provides a full charge to an empty battery within about 3.5 to 4.0 hours. As of today, in the most recent 2018 miles our Chevy Volt has guzzled 3.2 gallons of gas. That makes for an astounding 631 miles per gallon!!! Gotta love that! Be among the very first to see this brand NEW video of the Enagic Compensation Plan. 10 minutes long, fun, interesting, informative. There is no other compensation plan like this one – it is FABULOUS! Of course the amazing quality and functionality of Kangen Water Ionizer machines makes the business work, but you can easily see why this compensation plan is so lucrative. We have this machine in our kitchen to make all our drinking water. It is absolutely marvelous. It is the Enagic SD501 Kangen Water Ionizer. In this video, I’m demonstrating how to make the five different types of water with the ionizer. This is a HUMAN clinical study. Many clinical studies involve rats and rabbits instead of humans to test results. It’s important that the HDHI ProArgi-9 Plus study is a human clinical study. Yes, we have a Chevy Volt. So far it is proving to be a very excellent investment for our family. We bought it in February, and here we are in April having only put 3.9 gallons into the tank since we purchased the car. And we would not have needed to put that gas in – we could still be on our first tank of gas! The past 1800 miles, we have burned less than 3 gallons. That’s right… we are getting better than 600 Miles per Gallon!!! Watch for more information about our results with the Volt – I’ll put updates on this blog. Posted byadmin May 2, 2012 May 7, 2012 Posted inChevy VoltTags: chevy volt, electric vehicle, hybrid car, voltLeave a comment on Chevy Volt is GREAT! I must tell you about something very exciting that can help practically every person. I studied Nutritional Sciences because I believed with that knowledge I could help people live LONGER and HEALTHIER. This is certainly the case with a product called ProArgi9 based on Nobel Prize Winning research and more than 10 years of Clinical development and testing. Dr. Joseph Prendergast who is the formulator has treated more than 8,000 patients with ProArgi9 over the past 19 years and not one of those patients has had a heart attack or stroke. Prior to using L-arginine, Dr. Prendergast had to refer 30% of his patients for cardiovascular surgery, but not since implementing L-arginine therapy in his practice. On January 22, the High Desert Heart Institute of California released to the public results of a clinical trial using ProArgi9 with heart patients on the transplant list. They were all on the transplant list because they had exhausted all other medical options for help. After using ProArgi9, all the trial patients obtained remarkable improvement and all of the patients were REMOVED from the transplant list. More exciting information will be posted soon on the results of the clinical trial. Welcome friends and family! 2010 seemed to whiz by so fast. Here’s very brief recap of what has transpired. The greatest news… Laura graduated from High School! The biggest news… the boys continue to GROW! We had to move Nicholas to 3rd position in our family lineup this year. Believe it or not, Bob can still water ski! A Magic Trick You Won’t Believe! You have to watch this – it is amazing! Posted byadmin April 16, 2010 May 7, 2012 Posted inMagicTags: beauty, CHLOROPHYLL, Magic, pigmentation, THRILL1 Comment on A Magic Trick You Won’t Believe! ProArgi-9 is a product with a lot of science behind it. The SD501 Water Ionizer has developed an excellent reputation in the Water Ionizer industry, and for a number of great reasons. For anybody who is shopping for Water Ionizers, the following is my personal review of the Enagic SD501 Kangen Water Ionizer. Kangen Water is the trademark of Enagic USA, Inc.
Water Ionizers are being purchased by people in search of higher health. Today, we need to take responsibility for our health as a result of neither the federal government nor anybody else is handing out free well being and wellness to us. At least the level of health and wellness that we desire. Water Ionizers are useful for a lot of reasons. One of the important issues they’ll do is help with restoring body pH because over time bodies can accumulate acid from the abundance of acidic meals and drinks within the typical American diet. An acidic pH within the body will also lead to continual issues, some of which might be serious. In an effort to solve the pH problem, many people try consuming foods which can be alkalizing, however as a result of the body is seventy five percent water and much of our food plan is water it is tough to realize important progress in altering human body pH with food alone. Altering water consumption to Ionized Water can have a dramatic impression in an individual’s capacity to balance their body chemistry pH. I studied Nutritional Sciences and due to this fact the standard of water produced by a water ionizer is important to me as a result of I need a water ionizer that will likely be greatest for my health. There are various manufacturers and models of water ionizers on the market today. For me, there is only one that I’d consider using. It’s the Enagic SD501 Kangen Water Ionizer Machine. Following are a few reasons why I really like my Enagic SD501 Water Ionizer. Enagic ORP – This is the Oxidative Reduction Potential. A more detailed explanation of ORP will likely be mentioned at greater length in another article. Basically, the stronger the negative ORP ranking, the higher the quality of water produced by the ionizer. The ORP helps slow down the getting old process. The Enagic SD501 is rated for -800 which is very robust and really excellent. ORP varies by source water and also by the rate at which water flows through the ionizer machine and rankings as good as -1200 are achievable by the SD501. ORP is likely one of the most important attributes that you need to review when searching for a water ionizer. The Enagic SD501 is in a league by itself with its highly effective ORP score, and I really like it for that. All the Different Water Types Enagic Makes – Not only does The Enagic SD501 produce excellent alkaline drinking water, but it makes five different types of water which can be used for various purposes. These include the following. Strong Acid Water with a pH of 2.5 which kills germs can be used for cleaning the kitchen and bathroom, as well as for treating skin conditions. Beauty Water also called Acid Water with a pH of 5.5-6.0 which is used for washing the face and hair, and it also can be used for cooking and makes for a wonderful pasta. Clean Water also known as Neutral Water with a pH of 7.0 which can be used for drinking when you take medications. Alkaline Kangen Water for drinking, ranging in pH from 8.5 to 9.5, is what most people get the Kangen Water Ionizers for, and this water is absolutely wonderful in taste and in purpose. Strong Kangen Water also known as Strong Alkaline Water with a pH of 11.5 which can be used for cleaning waxes and pesticides from produce as well as removing oil and grease stains from clothing and carpet. Enagic Large Plate Size – The Enagic SD501 has seven large electrolysis plates providing a total surface area of 490 square inches. This is important because the quantity and quality of ionization is a direct function of how much of the water going through the water ionizer can come in contact with the electrolysis plates. The smaller the plate size the fewer water molecules that can be ionized. The greater the plate size the more water molecules that can be ionized. The Enagic SD501 is in a league by itself with plate surface area. Not only that, but the plates are solid and are made with medical grade material and quality enabling the SD501 to be classified in Japan as a Medical Device. These plates are made to last a very long time, providing years and years of quality Kangen Water. Enagic Powerful Electrical Power Supply – The Enagic SD501 comes with a transformer power unit supplying a whopping 230 watts of continuous power to the huge electrolysis plates. Many of the smaller brands and models of ionizers would burn out with this much power being applied to their tiny ionizer plates, but the Enagic SD501 is build to handle the power and it puts this power to good use in producing a large quantity of ionized water at a capacity and speed that places the SD501 at the top of the water ionizer industry. No wonder the Enagic SD501 is the only water ionizer that has received Japan’s Medical Device of the Year Award. Enagic Capacity and Speed – With the Enagic SD501 you do not need to worry about water speed of capacity because there is plenty of both. You do not need to run the water through the machine at a trickle in order to ionize your water. The machine does not have speed constraints inside to slow the water down for you. These are not necessary with the SD501 because of its seven large solid ionization plates with 490 square inches of surface area powered by a 230 watt transformer powerhouse. This is a machine that really produces the water. And it does not fizzle out afer a few weeks or months – this machine keeps producing large quantity of high quality ionized Kangen Water year after year after year. No wonder Enagic offers a 5-year full warranty on this machine. It is really built to produce and it is really built to last. Enagic Quality – The Enagic name has really become to be known in the water ionizer industry as quality. And no wonder, because Enagic has a 22-point inspection by 5 inspectors for each and every machine they manufacture. And Enagic does not use Titanium with impurities such as iron, nickel, chromium or copper. The Enagic electrode material is 99.99% Titanium for medical grade quality and for medical device classification. And the coating of the electrical plates is Platinum-plated Titanium. Enagic Warranty – The Enagic warranty is a 5-year full warranty, and it is a manufacture warranty which is different from many of the other ionizers on the market which offer a retailer warranty. Also, in the water ionizer industry it is important to carefully read the small print to understand what the exclusions are for many of the brands of ionizers which may void their warranty depending on source water conditions or other factors. Enagic stands behind the machines they manufacture. While the Enagic SD501 comes with price tag that requires consideration, there isn’t a doubt that it affords real value. Especially when you consider that purchasing a cheaper water ionizer which will possibly need to be changed in a number of years has a inbuilt recurring price when it wears out in contrast with the SD501 which is anticipated to last at least 15 or more years. The advantages of Kangen Water can be researched on-line and Enagic Water Ionizers can be found on-line from a Kangen Water Distributor. ProArgi9 is a Synergy nutritional product formulated by Dr. Joseph Prendergast and manufactured by Nature Sunshine for Synergy Worldwide. ProArgi9 is a food supplement with L-Arginine and L-Citrulline and other incredibly good-for-you ingredients to strengthen the cardiovascular system. Visit the blog to learn how you can say “NO” to Cardiovascular Disease! 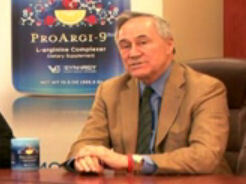 Equipped with his own personal experience of solving his circulatory system health, as well as the resources of his colleagues and the Nobel Prize winning research of three American doctors, Dr. Joe formulated a nutritional concoction known today as “ProArgi-9” which he has treated his patients with for many years. Since 1991, he has treated more than 7,000 patients with this nutritional supplement and not even one of his patients has had a stroke. Not even one has had a heart attack. Prior to ProArgi-9, Dr. Joe used to refer 30% of his diabetic patients for bypass procedures. Today, less than 1% of his patients need to see a cardiologist for any reason. ProArgi-9 has numerous ingredients that work synergistically together to accomplish its mission. L-arginine obtained from the drug store will not work very well. Once in the body the effectiveness of L-arginine lasts for a “few seconds” and while the benefit is great the coverage beyond those few seconds makes it ineffective in providing any significant value in fulfilling its true mission which is to enable the body to produce Nitric Oxide at the specific location of all of the internal surface area of the entire circulatory system. ProArgi-9 is able to do what other L-arginine products cannot do in that it delivers a continuous supply of L-arginine throughout the circulatory system for up to 36 hours of coverage per dose. The High Desert Heart Institute in California just recently concluded a clinical study of ProArgi-9 on 33 heart transplant candidates who had totally exhausted all known medical options and the only remaining hope for their continued life was a heart transplant. All 33 received ProArgi-9. All 33 patients got well enough so they no longer qualified to remain on the heart transplant list. People who could not even walk 10 feet are now walking miles and miles. Patients who were confined to the hospital have gone home and now have their lives back again. The results of the clinical study are currently under review by a medical statistician in preparation for submission for publication in a medical journal. The product does not just work for sick people. It works for everyone. Athletes are using the product because it helps with muscle recovery and it promotes human growth hormone which improves the ratio of lean tissue to fat tissue. New Olympic records are being set because of the science in ProArgi-9. Many people are using this product and having incredible things happen to their health. The same research that led to ProArgi-9 nutritional supplement also led to Viagra and related drugs, but because ProArgi-9 is a food supplement and it is not a drug it is safe and it does not produce the side effects like drugs designed to produce similar results. Many people who are using ProArgi-9 are getting off of their blood and heart medications like statins. No more Lipitor for me! So, with that background, perhaps you can see why I took two days to fly out to SLC to meet Dr. Prendergast in person. I started on ProArgi-9 and it immediately knocked my blood pressure right down into the very desirable range. It immediately dropped my bad cholesterol way down into the very desirable range, and my good cholesterol is sitting nicely in a better-than-target position. It immediately dropped my triglycerides down into the very desirable range. My degree is NUTRITIONAL SCIENCES. I chose that course of study because I believed with the information I learned I could help people live longer and enjoy better health. In my opinion, ProArgi-9 is the best nutrition product I have ever seen or used in my entire life. It appears to help every person who uses it. I recommend every person use this product.